Diana Samuels (“Nine Lives, Sixth Sense: Cat at Veterinary Clinic Seeks Out Ailing Cats,” 18 August 2010) tells the story of a very special cat named Christopher who acts as a guardian angel to other cats at the Nine Lives Foundation Feline Well-Care Clinic where he lives. When another cat at the clinic needs help, Christopher sits outside his or her cage until a staff member lets him inside. Christopher often knows when something is wrong before clinic staff do, and alerts them to potential emergencies. 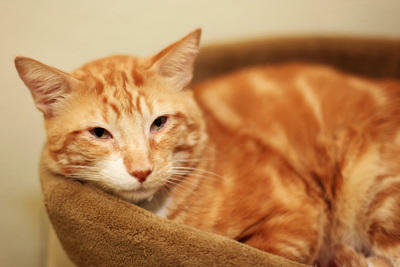 A good-natured orange tabby estimated to be 3 to 4 years old, Christopher was brought to the clinic by passing cyclists who found him by the side of the road with a fractured pelvis. After recovering at the clinic, Christopher continued to live there, comforting the sick and terminally ill, and alerting staff to cats that require immediate attention. Christopher recently saved the life of a little black kitten that arrived at the clinic with severe anemia, requiring a blood transfusion. Chief veterinarian Monica Thompson was unable to draw enough blood to determine her type, but Christopher jumped on the operating table, nuzzling the kitten and rubbing against Thompson. Thompson decided to use him for the transfusion and hope for the best. It turned out that Christopher and the kitten had the same uncommon blood type, so the kitten was saved. Christopher also voluntarily socializes feral kittens that arrive at the clinic too wild to touch, turning the hissing, growling little cats into tame, friendly individuals that can be adopted out. Given his wonderful personality and many talents, there are plenty of people who have asked to adopt Christopher, but Thompson wants to keep him at the clinic, where he can carry on his good work.